It means the bubble is made to a specific perfectly sized shape that provides optimal heating and insulation. The extra material thickness across the base increases strength, efficiency and longevity. Lasts Longer: The improved material composition and leading edge UV inhibitors provide the best protection available for a pool blankets. A unique extrusion technology provides even distribution of the material across the Air Cell making it stronger and to last longer. 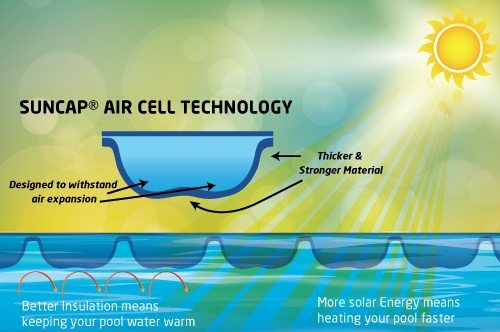 The base layer of Suncap Air Cell is made thicker which improves resistance to degradation from chlorine and salt. Solar Heating: The blue translucent colour allows for the sun’s energy to penetrate into the water. The material is designed to allow short wavelength Solar Energy to pass easily through its surface. This heat, which radiates at longer wavelengths, is then maintained under the surface due to the special design of the blanket. This means warmer water for longer. Air Cell Shape: The Shape and size of the Air Cell are designed to provide some solar heating and thermal properties. Its design allows for air expansion inside the bubble without compromising strength of the material. Furthermore the shape and size of the bubble provides Superior buoyancy and excellent water adhesion during strong winds, it rolls up evenly on roller systems. Producing Quality Pool Cover material that withstands harsh conditions takes years of knowledge and experience. For over 25 years Suncap have been providing swimming pool cover solutions to Australian Pool owners. We provide pool owners across Australia with highly-durable and effective pool covers that are easy to install and will provide ongoing protection from water evaporation whilst increasing the temperature of your pool.